The Klein House, also known as High Sunderland. A house inspired by Yorkshire’s award-winning modernist masterpiece Farnley Hey is for sale and looks as fresh now as it did in the 1950s. Sharon Dale reports. Peter Womersley was still a student when he designed Farnley Hey as a wedding present for his brother John. The modernist house, near Huddersfield, was influenced by the work of Frank Lloyd Wright and Le Corbusier, and when it was revealed in 1954, it caused a nationwide sensation. Constructed by local builder Peter Stead, it is timber framed and clad in stone, wood and yellow glass with large floor-to-ceiling windows. Inside, there is a collage of exuberant materials, such as polished York stone brick, camphorwood and Formica. A remarkable first project, it won a RIBA medal and hinted of greater things to come from the precocious trainee architect. One of them, The Klein House, which was built three years later in 1957, is now on the market and looks as fresh and contemporary as it did 60 years ago. The property is for sale with themodernhouse.com for £795,000. It was inspired by Farnley Hey and boasts Womersley’s signature geometric, modular features. It sits on a rural plot near the Scottish border town of Selkirk and was built for renowned textile designer Bernat Klein, who created fabrics for Christian Dior, Balenciaga and Yves Saint Laurent. According to architectural historian Peter Green of Historic Environment Scotland, Bernat Klein was friendly with Frank Schofield who had worked in the Huddersfield mills before moving to Galashiels, where he established his own dyeing and finishing firm. Schofield told Klein about Farnley Hey and the designer made contact with the Womersleys and went to see it before commissioning his own version. The four-bedroom house, still owned by the Klein family, is in largely original condition. The flat-roofed home is a rectangle sub-divided into eight-foot modules with courtyards and a carport. Like Farnley Hey, it is timber framed and has horizontal coloured glass panels and varnished timber boarding. Simon Green says the interior typifies Womersley’s approach of creating an expansive feel by using an open-plan design with minimal circulation areas. Spaces are defined with changing floor levels. Storage units are used to create separation and there are secret doors. The creativity of the design has been enhanced by the inventive use of mixed materials and the colourful internal and external tiling and fabrics added by Bernat Klein. According to The Modern House, the living area is one of the most spectacular spaces seen in any residence of the period. It has a polished obeche wood ceiling, bespoke fitted furniture and a sunken central seating area. The house has views over the Ettrick Valley towards the triple peaks of the Eildon Hills. Womersley, who was a regular visitor to his parents’ property in Scarborough, loved this Borders landscape so much that he built a home for himself nearby. This left him open for more work in Scotland and in 1963 he designed the “concrete origami” football stand at Gala Fairydean FC. His gold E-type Jag was a clue to an exhibitionist streak and he was the architect of many other striking buildings, including a sports centre for the University of Hull. He left Scotland to work in Hong Kong before retiring to Italy. Ill health brought him to the home of his niece in London, where he died in 1993, aged 70, leaving an impressive legacy. Many of his buildings are now protected and revered. The Klein House has a rare Category A listing from Historic Environment Scotland and the Klein family hope it will go to someone who will preserve its integrity. That is what happened to Farnley Hey. It wasn’t listed when John Womersley put the property on the market in 1958. 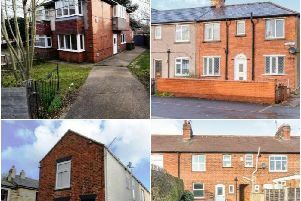 Such was the interest, the estate agents charged £2 for the particulars – the equivalent of £30 today – to dissuade timewasters. The late Joe Battye, who owned an engineering company, snapped it up. It’s thanks to him that it remains a fabulous Fifties building both inside and out. It was one of the ﬁrst post-war buildings to be listed in 1987 but for the first 30 years of its life it lay unprotected. Joe proved to be a wonderful custodian. *The Klein House, also know as High Sunderland, near Selkirk, is for sale at £795,000 with The Modern House. It sits on a three-and-a-half acre rural plot surrounded by woodland and open fields. The single-storey property has an entrance hall, main living space with sunken central seating area, a study area, library, dining area and kitchen. There is also a main bedroom with a dressing area and en suite bathroom, a shower room, second bedroom, a large family room, which could be divided into two bedrooms and another en-suite bedroom and a studio.